Picture this, we’re rolling through the Sussex countryside happily, looking forward to a lovely dinner out and pleased to have escaped the summer bustle of the city. Happy days! Panic ensues, we’re going to be late! Where the hell is Lower Beeding? How many times can you circle a roundabout?! A stark lesson that we are lost without phone signal and Google Maps. Luckily, after resorting to good old fashioned road sign reading and domestic bickering we make it to the pub in one piece. 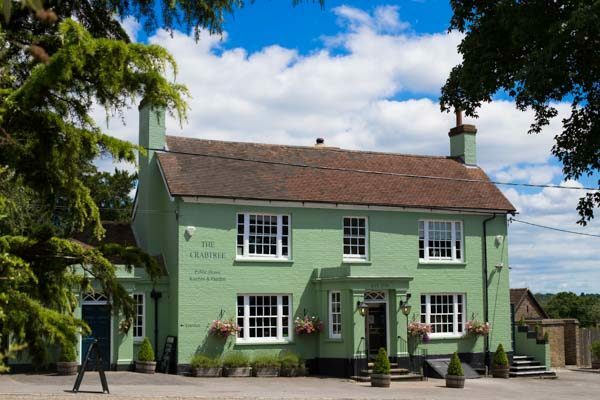 Located just off the A23 and not far from Horsham, The Crabtree is nestled away down a small road with stunning views of the surrounding countryside. Entering the pub, we are greeted by Hamish, manager of The Crabtree and a man who has an impressive background in the restaurant industry having previously worked at Food for Friends and the popular Due South in Brighton. A family-run pub, The Crabtree is owned by Simon Hope (Hamish’s father) and you can feel that the team is tight-knit and well versed in the art of great service, smiles are cheery and we are immediately offered a stroll around the pub to see the snug bar and the sweeping gardens which house wedding marques in the summer and plenty of barbecues. 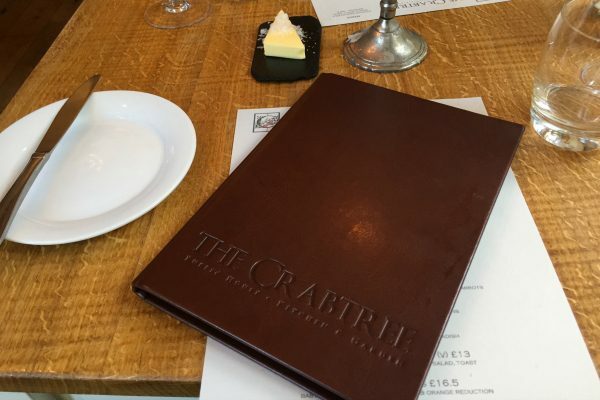 The benches even have sheepskin rugs on to cosy up your evening drink – small innovative touches that I notice throughout our evening at The Crabtree. Settling down in the bright conservatory area we peruse the menu and I’m glad to see it’s short and sweet. This implies that the chef works day to day with seasonal produce and isn’t trying to bombard you with too much choice. Whilst choosing we munch on the fresh bread that is brought to the table with a side of sea salt infused butter. Hamish tells us that all the bread and sweet treats are made in the outhouse next to the pub by their talented pastry chef, including the celebratory cakes that can be made to order and all the compartments of their popular cream tea (£20 per head). It’s a warm day and we fancy starting light so I choose the mackerel to start and Tom goes for the pork. 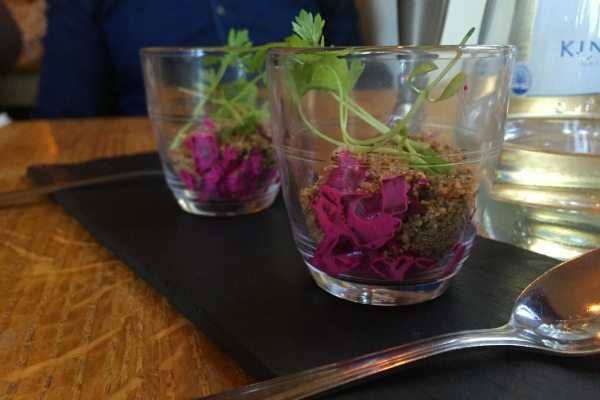 An amuse bouche comes first, a beetroot tartare that is full of flavour and topped with sprigs of wild parsley grown in the pub garden. 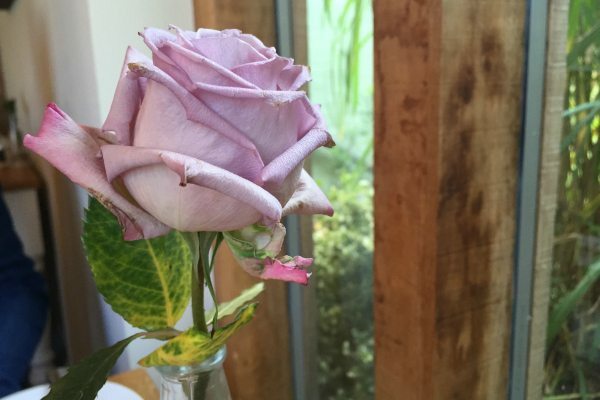 It matches well with the dry rose that I have chosen. 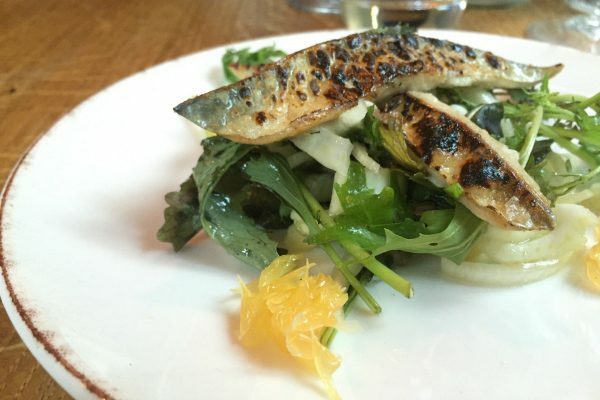 Our starters arrive and the presentation is uncomplicated and elegant, the mackerel served charred skin up on a bed of rocket and fennel with touches of orange which provides a delicious acidity that cuts through the oily fish. The smoked aioli is rich and coats the rocket well whilst letting the peppery flavour shine through. 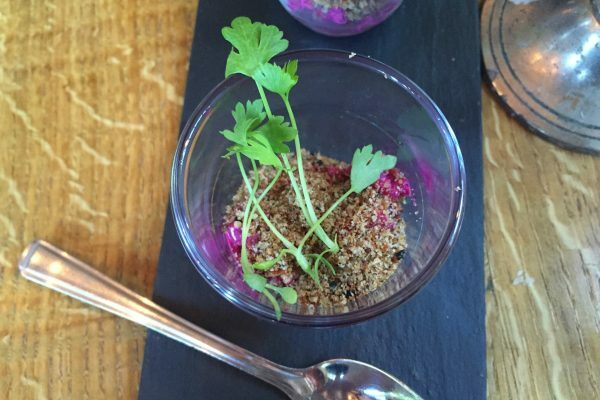 Tom chose the spiced pork with apple, rocket and granola, another summery dish with oodles of flavour. The pork is tender and juicy and the sunflower-seed granola adds a satisfying crunch and texture alongside the soft rocket leaves. 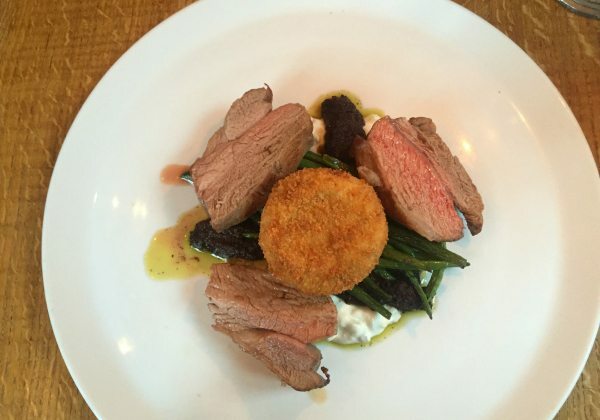 Our main courses come out with a flourish of summer! 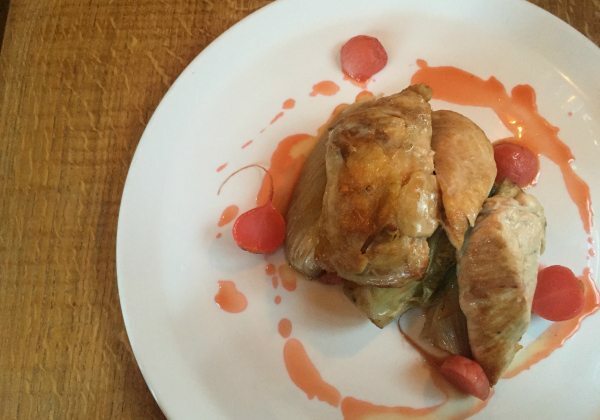 My ‘chicken two ways’ is served on a bed of braised gem lettuce, fennel and radishes which add a vibrant splash of colour to the white plate. The chicken breast is pan-fried whereas the thigh has been cooked sous-vide ensuring the meat is tender and falls off the bone effortlessly. Braising the lettuce gives the dish an interesting twist, it still retains some crunch but the infused flavours of the braising tonic allow little bursts of flavour and moisture with each bite. 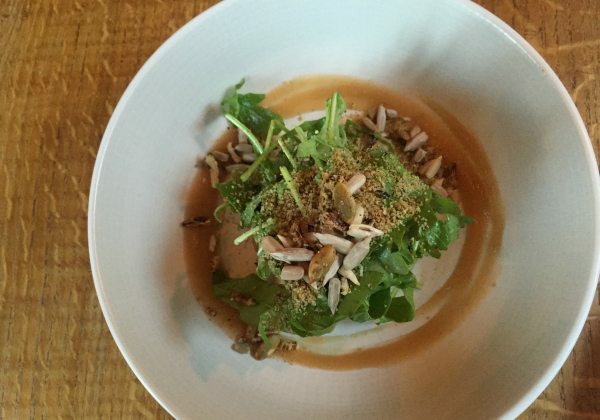 The part of me who enjoys a carb wished for a side of something else but I certainly enjoyed the dish. Remember the part when I mention domestic bickering? Round two kicked off when the dessert menu was brought to the table. As usual I win and go for the dish we are both eyeing up – the chocolate and cherry. 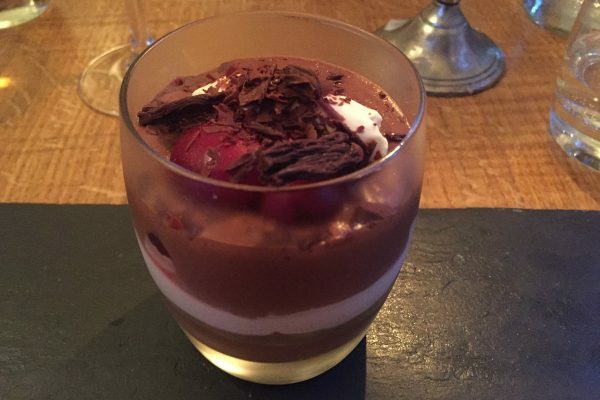 It comes out looking like a posh trifle, layers of rich chocolate genose, chocolate creme patisserie and raspberry sauce topped with cream and cherries. Needless to say it’s a taste sensation. After loosing the dessert battle, Tom has his second choice, the lemon meringue cheesecake with limoncello ice cream. 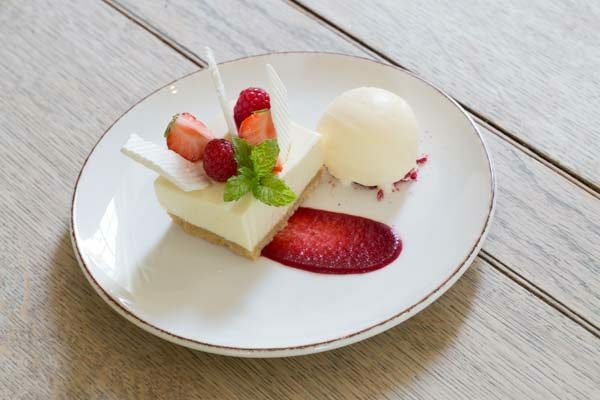 The cheesecake topping is zesty and rich, with shards of homemade meringue adding a crunch to each bite. The limoncello ice cream fizzes on the tongue and the summer berry garnish adds a welcome freshness. It’s clear that the Pastry Chef at The Crabtree is extremely talented as the desserts are exceptional and well worth a trip outside Brighton. We leave the Crabtree vowing to return as soon as possible for an afternoon tea in the garden or perhaps a Sunday Roast with friends before the summer is out and I fully intend to kept to my word! 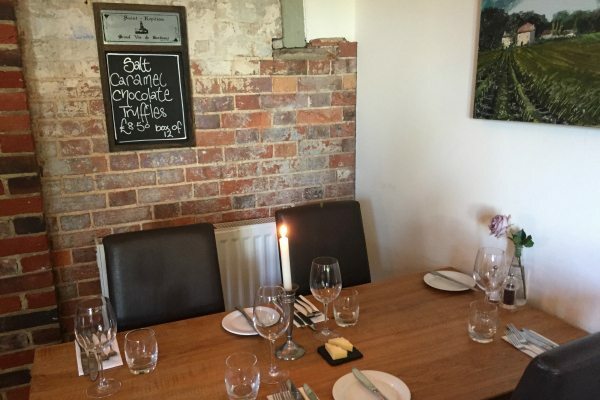 It’s not often you discover such fantastic food and service in a country pub, but Hamish and the team certainly have set the bar high, providing not only a fantastic place to eat and relax but also a community-focused venue where you can order a special cake or perhaps even hold a wedding reception.